Art Nouveau brooch womans head with snowdrops symbolizing a new beginning: Description by Adin Antique Jewelry. 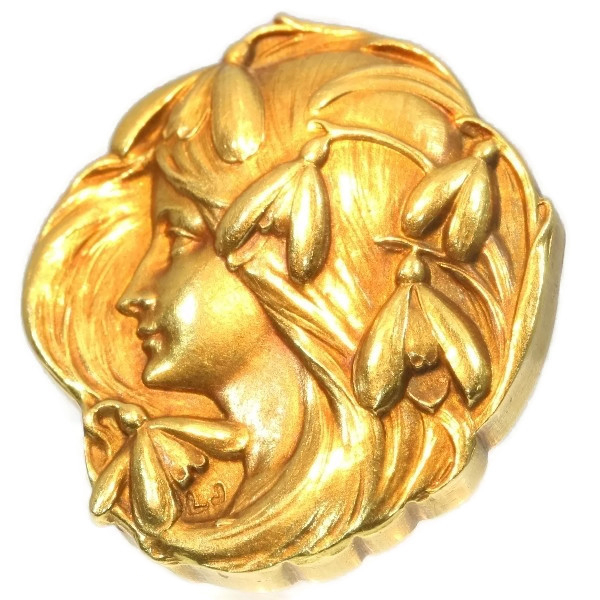 This 18K yellow gold Art Nouveau brooch from 1890 is a depiction of a new beginning as the blossoming snowdrops announce the arrival of spring while arching all over the right side of the bas-relief of a fair maiden in profile. Her locks lashing through the wind will always remind you to let your hair down once in a while. Extra information: Snowdrops - At the end of the winter when nature seems dead and the earth shrunk by cold, as an emblem of promise and consolation, the snowdrop is the first to announce spring and long bright days to come. In England this flower is also known as candlemas-bells or fair maids of February. The reason for this is that the flower normally blooms at the second day of February that is called candlemas day. On this day, fair maids in procession and decorated with white flowers bring wreaths of snowdrops to church. According to the legend when Eve sat at the cold barren ground weeping in memory of all the lovely flowers of the lost paradise an angel approached her and tried to comfort her. Ever since the first sin, flowers didn't bloom anymore in the Garden of Edin and it was snowing continously. The angel blew at one of the falling fine white snow flakes and it fell on earth as a clean, small flower. And wherever the angel wings touched the earth a crowd of white flowers sprouted through the snow. Comforted by the sight of these beautiful flowers new hope blossomed in Eve's heart. The Russian Empress Catherine The Great (1729-1796) was a great lover of snowdrops. Once, she installed a guard to save a particularly large snowdrop to prevent it from being plucked. The guard post remained there year after year even when the reason why was long forgotten. Then when the Emperor Alexander II (1818-1881) noticed this guard post and wondered why there was a guard post while there was nothing to protect, that the original reason was recovered. In some parts of Europe snowdrops are given with St. Valentine. Monogram: LJ - We looked for information to see who's behind this monogram but without result. We would appreciate to receive any information on him/her.